With about 40 million Americans going camping every year, not everyone knows what to look for when they need a tent to sleep in. 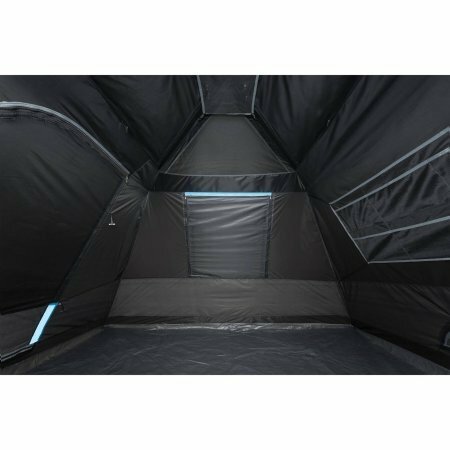 For anyone dealing with light sensitivity, for people who aren’t heavy sleepers, or if you want to stay warm in the winter a blackout tent is a smart choice. When shopping for a darkrest tent you need to consider all of the costs and benefits. Here are four things to look for in a tent like this one. When you choose a blackout tent, you need to ensure that it’s big enough to hold your party. For example if you’re a young family of three, decide on whether you need one just big enough for three or if you’d want it bigger. If you’re still growing your family, investing a lot of money in a tent for three might be a waste of money soon enough. Extra friends, dogs, or lots of gear could require that you have a bigger capacity in your tent. You should always assume that you’re going to need a little more space and up size by one or two persons. If you or any of the people you’ll be camping with are claustrophobic, you’ll need to reserve some extra space for them to feel comfortable. Traveling with larger or taller people means that it will be hard for them to fit in the averagely sized tent. Assume that the tent capacity is measured by average height, average weight people. If you need a little bit of extra room to sleep and are accustomed to a large bed, you need a larger tent. Many blackout tents are built to accommodate up to five people. Without adequate room, you could have trouble sleeping and enjoying your vacation. Blackout tents are great for people who struggle with being in the sun. Whether you have a skin condition or just need to wear a ton of sunblock, a blackout tent ensures that you don’t get burned or suffer skin problems. Blackout tents now use certified laboratory testing on their fabrics. The SPF is now built into the fabric, ensuring that you’re protected against the sun’s UV rays at all times. Check and see what kind of protection the actual fabric your blackout tent is made with to get the protection that you need from your tent. While you should never skimp on sunscreen, having a fabric to protect you while you’re napping or resting in direct sunlight helps give you an extra boost. Also, remember that you can get a sunburn even when its overcast. The battle against sunburns is a constant struggle when you’re out in the wilderness. Take it seriously by getting a blackout tent that’s on your side in helping to protect you from being damaged or burned by the sun. Blackout tents are fantastic for helping you get to sleep while camping. Not everyone is accustomed to sleeping or waking up outside. If you’re asleep in a sunny place after waking up in a dark room for years, you’ll be awoken hours before you might desire. In the summer months, the sun goes down late and comes up early. This is troubling for anyone on a schedule while hiking, climbing, or on vacation. For light sleepers, a light blocking tent ensures that you won’t wake too early in the morning. You can set your alarm for when you need to wake up and be completely in control of your sleep schedule. Blackout tents cut all of the light out of your room. If you need to wake up, set yourself an alarm. Otherwise, you’ll sleep clear through your intended wake-up time. Blackout tents provide insulation that buffers you from outside light, temperature changes, or sounds that could disturb your sleep. Blackout tents are perfect for ensuring you control the temperature any time of year. While camping in some parts of the country, the temperature varies wildly from day to night. There are temperature disparities in deserts that vary by 40 degrees Celsius in a 24-hour period. Blackout tents with waterproof properties help to control the temperature. When seeking out a blackout tent, check that the tent you’re considering has a high rating for waterproofing. The fabric that your blackout tent is constructed from should be insulated and rated to hold in temperature. Because your blackout tent is dark, it should both attract heat and hold it inside. If you’re camping in the summer and looking to remain cool, check for a fabric that’s rated to stay cool all year round with lots of ventilation. Larger tents provide you with separate blackout bedrooms for sleeping and other covered regions for resting. Experience the variation and get as comfortable as you need to be with blackout tents built to accommodate temperature changes. Not every blackout tent on the market is built with the same kind of high-quality fiberglass or aluminum frame and durable fabric. When in search of a blackout tent whether an individual camper or a family, check for safety and durability. Also ensure that your blackout tent is made with materials that are waterproof, UV protecting, and that come with a good warranty. 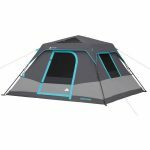 This tent is from the popular Sundome range of tents from Coleman. These are a simple design comprising of a single room dome structure. They’re also offered in various sizes to suit single travelers or families. This 4 person option is unique in that it offers dark room technology. This not only keeps the main tent space cool but blocks out light for all those that don’t want to wake with the birds. For the most part the Sundome performs well but does have a few limitations. 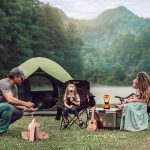 Budget brand Ozark Trail has also thrown its hand into the dark room tent arena with this 6 person offering. The tent is spacious enough for a couple of queen size airbeds and sets up in an instant thanks to the pre-attached poles that lockout into place. But how does the Ozark perform as a dark rest tent?